I've successfully continued easing back into exercise, but what about easing back into BLOGGING? Hellooooo, please forgive me for my neglect! Sure, I've checked in with a few fun dares (have you tried sunchokes yet??) and some cool events and products I've had the pleasure of trying out, but I've been too busy working my day job to post as frequently as I used to, and I miss it!! I really do. So I'm going to start up again, with dares and with tidbits, with info and with --- anything! I'm simply daring myself to blog more regularly once again, easing back in just like my fitness. First, let's announce the winners from last month's cookbook giveaway!! Congratulations to Carolyn B. and Debra C.! You'll each receive a copy of The Paleo Approach cookbook, signed by the author, Dr. Sarah Ballantyne. Enjoy!! Starting to think about new year resolutions? If you're setting a goal, start planning out how it will be a S.M.A.R.T. Goal, OR consider setting a non-traditional resolution. It's been a while since I shared with you my obsession with podcasts, but podcast-talk has recently slammed hard into the mainstream thanks to the new hit Serial. It's different from my previous podcasts in that it's a continuous (true!) story told over time, week after week. My friend LT got me hooked, and you will be too. if you're looking for a compelling listen, I dare you to check it out--just be sure to start from the beginning! Winter's here, so it's the perfect time to curl up with a warm cup of bone broth. 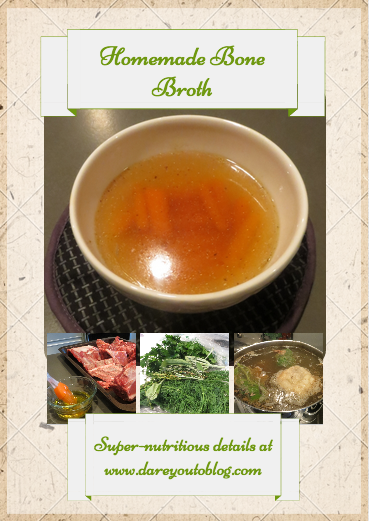 If you want to know what's up with bone broth--what its nutritional and health benefits are, as well as how you can make it at home--check out this post on bone broth. My dare here for the next two-three weeks of holiday parties and meal gatherings is simple: don't stress. Many people who are health-minded (as you likely are if you're here reading this) will drive themselves nuts by trying to stay "on track" during the holidays. Eat this, don't eat that... setting unrealistic expectations and then kicking themselves afterwards. If you're worried about overindulging or eating the "wrong" foods, please remember to forgive yourself and move on. Stress causes chemical changes in the body that are just as, if not more, unhealthy as some of the foods you might feel badly about eating, so I dare you to let go of this stress! This time of year should be a joyful time, and while food can be part of the fun and cheer, try focusing on surrounding yourselves with people you love and have a good time. If that means you eat one too many cookies or agree to eat a dish you'd usually steer clear of, then simply know that your decision was just that--a choice. You made a choice, and it's done; let's carry on and enjoy the rest of the party!